This trek is without doubt the most famous ridge walk in Britain and completing it safely is the ambition of many hill walkers but do you have what it takes to face the huge drops on this notorious knife edge ridge? Under my guidance I can make this dream come true, technically it is not that difficult but you do need to be very sure footed, have some previous scrambling experience. and a fantastic head for heights if you aren’t sure if you are up to it why not come on my Y Lliwedd trek first to give you an idea if you ok with the exposure (huge drops) before doing this fantastic trek. This trek starts by following the Pyg track over a rugged path until we reach a stile with spectacular views down to Llyn Llydaw and across to the towering cliffs of Y Lliwedd rising ominously on the far shore. This main cliff face was used as the training ground for Sir Edmund Hillary and Tenzing Norgay leading up to there successful first ascent of Everest in 1953.we will be following this ridge line later as the second half of the horseshoe. But we have a more pressing matter first in the shape of the huge pointed mountain to our right, which is our intended route today. After forking right we start to gain height rapidly until we reach a broken rock chimney which involves a steady hands on climb, the fun has now started as we scramble upwards for a couple of hundred metres (660 feet) over knobbly and rugged terrain. 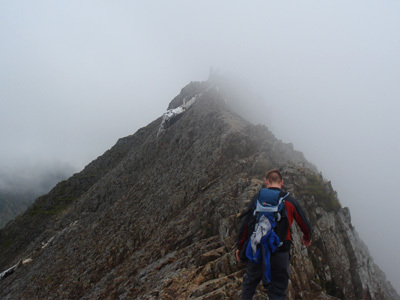 We have now reached the famous Crib Goch knife edge ridge, we then negotiate this very very narrow section with great concentration until we come to the three pinnacles directly in front, we then decide if we go directly over the top of these pinnacles or drop down to the left. We then pick up a defined path as we descend slightly into Bwlch Coch. Next on this breath taking trek is a huge buttress rising above that will take us to the Garnedd Again ridge, this requires more scrambling that brings us onto the top of this ridge. 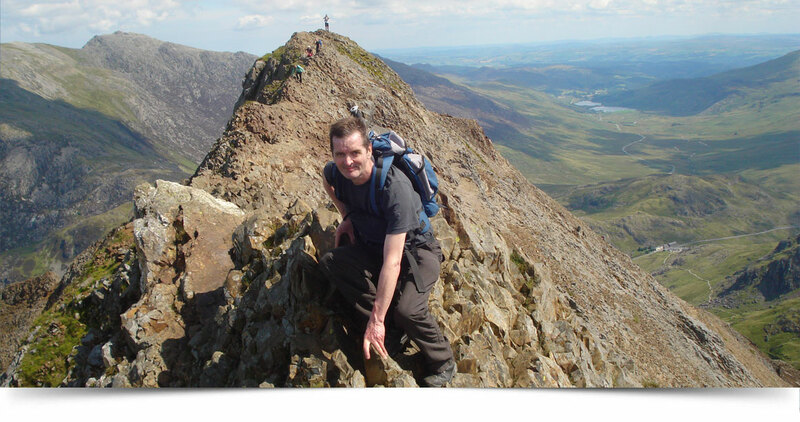 This area feels similar to the rock formation on Crib Goch but without the huge drops either side, eventually we reach the summit of Crib y Ddysgl .we can then reflect on our massive achievement we as leisurely walk to the summit of Snowdon with first half of the horseshoe complete. Upon leaving the summit it is very important for safety reasons that we pick up the correct path as we descend the Watkins path. This requires us to go 200 metres along the south ridge until we come to an upright marker stone. This is the start of the descent route down the Watkins path, great care needs to be taken as we negotiate this steep and eroded path with loose underfoot conditions. The track then descends steeply down hill to the right into Cwm Clan, this is where we leave the Watkins path and continue steeply up hill to the twin peaks of Y Lliwedd, this involves easy scrambling compared to what we have already encountered on this trek. We are rewarded with more breath taking views across to Crib Goch and into Llyn Llydaw far below. We then drop down steadily to the shores of Llyn Llydaw where we pick up the Miners path to take us back to the start. We can now look across to the huge pointed mountain where the day began and reflect on a day that will be remembered for a long time.